Being an adventure enthusiast, I am always in search for new places and thrilling experiences. It’s been almost three months since I’ve shifted to Pune and with each day I am falling more and more in love with this city. One of the main reasons is the ample opportunities for trekking in and around the city. Among the many amazing trekking routes is the Katraj to Sinhagad trek.. 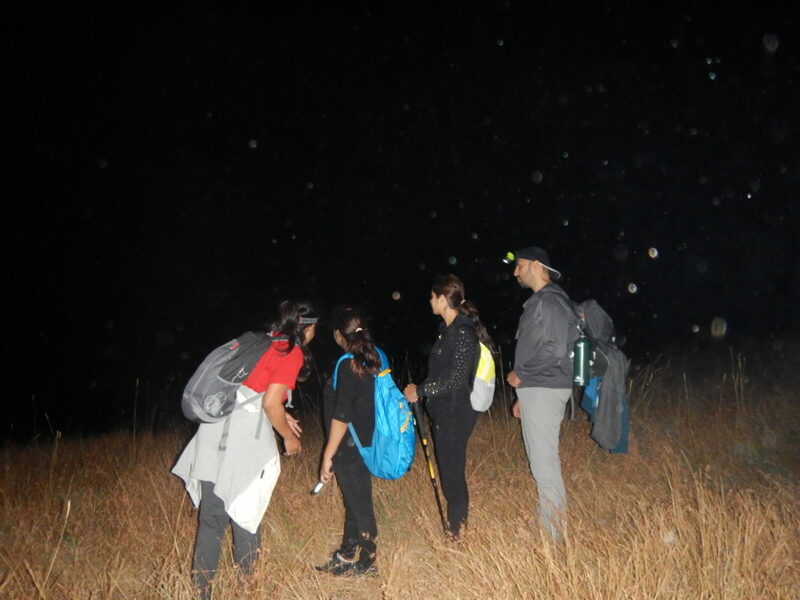 The night trek from Katraj to Sinhagad was in my to-do list for a very long time. Finally, I got a chance to do this trek with the amazing team of Adventure-Pulse. Katraj to Sinhagad trek route starts from the old Katraj tunnel and ends at the Sinhagad road head after crossing multiple hills covering a distance of almost 13 km. 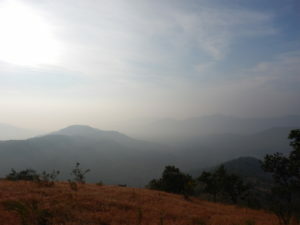 It is among the toughest treks available in the Sahyadris. The trek distance of almost km is a challenging task mainly because of the steep trails and multiple hills in between. On a full moon night the trek offers breathtaking views of the city skyline. The views are so surreal and the sunrise is worth all the hard work to climb the hills. We reached the start point after a short drive from Pune. After introduction and briefing, we started this exciting adventure from the base of the first hill. As we climbed the hill, we could see a stream of tiny lights from the torches of other groups moving up the first hill, above us. The weather was pleasantly cold and the moon was shining bright in the clear sky. After reaching a high point, we could see the city lights as well as the vehicles on the distant roads. For the next hour we walked on the same trail above the tunnel with the road and city light visible at a distance. Eventually the trail took us on the other side of the hill and then there were hills and valleys all around. 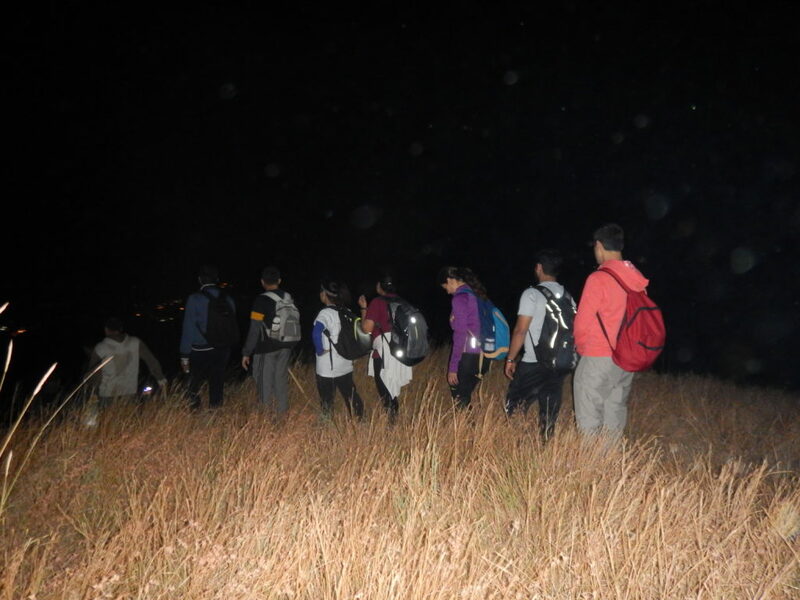 The climb up the first hill was easy and everyone was comfortable walking on the narrow trails under the moonlight. The moon was so strong that one could easily manage walking without the help of a torch. From the top we spotted the famous red antenna tower light which is placed at Sinhagad Fort. The descend from the first hill was comfortable. As we moved further towards the other hills the trails became very steep and slippery at some parts. Some of the sections were very hard to climb but with the support from fellow group members and the expert team of Adventure-Pulse, everyone managed to cross it. 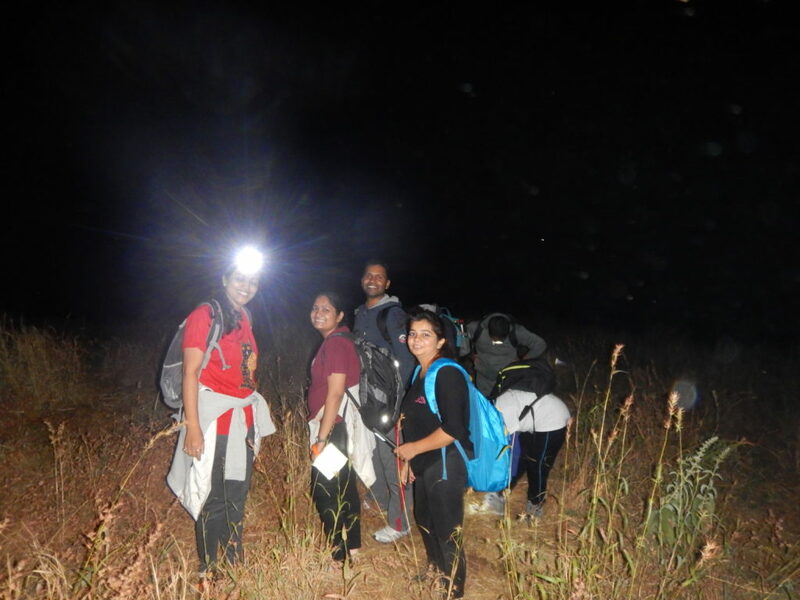 The trek leader and the team were continuously in contact with each other through walkie talkie and that way ensured that everyone was walking on the right path as it is very common to get confused in choosing the trails during the night. It started getting colder and windier as we moved higher. Everyone kept moving at a steady pace, taking breaks in between to catch their breath and to munch on snacks to keep their energy level high. The gradient of the terrain kept changing on different hills and with that so did the level of difficulty while climbing and descending. Around 06:00 am we were on the top of the last hill. The sun was out and different shades of orange and yellow covered the sky. It was one of the most magnificent sunrises I have ever seen in my life! After descending from the last hill, we finished the trek near the Sinhagad road head. I am happy that I was able to successfully finish this difficult night trek. It was great experience to meet like-minded people and the wonderful team of Adventure-Pulse who made this trek a memorable one. I have listed out few important points which one should keep in mind before doing the trek. K2S night trek is certainly for those who want to push their limits and have a passion for mountains and adventure. Though anyone with an average fitness can do this trek, it is very important to be in good shape. People who are regular with cycling, gym, swimming or any other sports can easily complete the trek without any difficulties. For all those who are lazy and not regular with any of this, “consistency is the key”. However, it is advised to do at-least – small treks before doing the K S. During the trek you will realize the importance of water. Carry at-least litre of water with you as it is very important to keep your body hydrated throughout the trek. Glucose water or Electral are the best way to boost up the energy. Also, try to set a pace while walking. Do not walk very faster and exhaust your body quickly. Sleep properly during the day and eat light for the dinner so that you don’t feel sleepy while walking throughout the night. A good music playlist or conversations with fellow trekkers helps a lot! Enjoy the surrounding, set small targets, take short breaks and click photos whenever possible to survive through this long difficult trek. Since it is a night trek it is very important to wear proper clothing. One should avoid wearing short pants as the trail also passes through dense vegetation. Long trekking pants helps to avoid getting hurt by dry grass and thorns as well as protects you from insect bites. Carry a jacket if you are trekking during the winter as it is expected to be windy. Trekking shoes plays a major role as the trails are very difficult in some section. The trail keeps changing from slippery rocks to soil and grassy patches, so choose a comfortable pair of shoes. Ankle length shoes like Forclaz 100/500 are the best option. Start the trek around 9: 0pm as the early start will give you sufficient time to complete the trek around Sunrise. Most of the time there are many groups trekking on this route which makes it easy and safe to find the trails and complete the trek. It is very important to do this trek under the guidance of expert guides like Adventure-Pulse. Please share your feedback and any questions you have regarding the trek. I would try my best to answer all your queries. Thanks!